Winners were recognized at RNAO's Annual General Meeting on Friday April 12, 2019. Every day, health-care professionals, members of the public and organizations help make a difference for Ontarians. 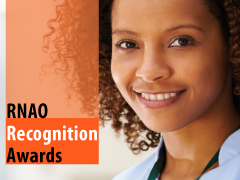 To honour these individuals and groups, consider nominating a colleague, yourself or your organization for one of RNAO's prestigious Recognition Awards. Split into five different categories – leadership, education/mentorship, group, student (undergrad) and member of the public – these awards acknowledge contributions made by volunteers and long-time members within the association. They also foster excellence in the nursing profession and promote the profession to the public by highlighting the best of nursing practice, education, research, administration and policy. The nominator and nominee must both be RNAO members in good standing at the time of submission, and must have held RNAO membership for at least the last two membership years. With the exception of the Honoured Friend of Nursing Award where only the nominator is required to be a RNAO member. Members of the RNAO Board of Directors, as well as anyone living with board members, are not eligible to be nominated. RNAO employees, as well as anyone living with RNAO employees, are not eligible to be nominated or to nominate others. If you have any questions, please contact Membership and Services or call 416-408-5618 or 1-800-268-7199 x. 220.